TransportiCA: New Series: "BICYCLISTS ARE HUMANS"
New Series: "BICYCLISTS ARE HUMANS"
Based upon preliminary results from municipalities and transportation departments, across the nation - and especially in California, bicycling deaths rose in 2016 to some of the highest levels this decade (NHTSA). Frankly, this is sickening. Because of TransportiCA's commitment to sustainable transportation - bicycling being one of the best modes, we are launching a new series simply titled, "BICYCLISTS ARE HUMANS." Sadly, we need to remind others - especially drivers and police - that bikes do not ride themselves, but are propelled by a living human being; someone who may also be a parent, a child, a spouse, or hold a number of roles in which they are depended upon by others. 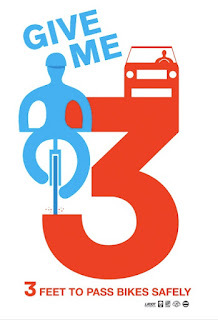 We also need to remind drivers that in the California Vehicle Code, bicyclists not only have the same rights and responsibilities as motorists, but can also use a full traffic lane for a bicyclist' safety. To begin our series, TransportiCA Staff Writer Monica Monedero profiles Mike Meza, a Sacramento resident, dedicated public servant and lifelong bicyclist. Mike's story of commuting by bike is amazing, especially given recent health and weather issues. We hope you enjoy the series and the bicyclists featured, but most importantly, we also hope you take the time to support, not only your local bike club, but especially the California Bicycle Coalition (CalBike). Donate to, or become a member of CalBike, and if you are unable to at this time, please assist cyclists statewide by taking part in CalBike's "Action Alerts." If you have a story you would like to share with us about an amazing cyclist, or how bicycling how changed your life, please send us your story at features[@]transportica.info.